About Us | Rakuten, Inc.
to create a better, brighter future for everyone. 1.3 billion members across the world. By using these services – whether shopping, streaming content, banking, or other – members can earn Rakuten Super Points, which can then be used to enjoy other services. As it enables and encourages user engagement across multiple platforms and services, the Rakuten Ecosystem is a unique strength that minimizes customer acquisition costs and maximizes the lifetime value of each Rakuten member to the Group and drives growth of gross transaction value (GTV). More than 100 million based in Japan can now easily access services across the Ecosystem using a single Rakuten member ID. We look forward to expanding the Ecosystem to encompass all of our almost 1.3 billion global users. In this way, Rakuten places a high value on operational excellence and the power of the organization to innovate. With a corporate culture that fosters the drive to create new businesses and empowers employees to take action, the Rakuten spirit of entrepreneurship enhances our competitive strength. Since we founded Rakuten in 1997, we’ve been guided by the idea of ‘optimism.’ For us, optimism has a special meaning. It’s not simply a faith that the future will be better; it’s an understanding that we can make the future better by what we do today. 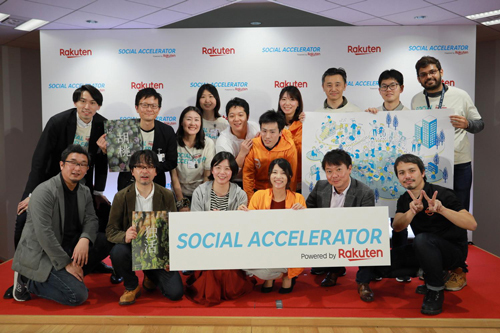 Rakuten is always innovating, evolving and experimenting to create a better future. Everything we do empowers people, businesses and society through innovation and entrepreneurship. We were the first company in the world to successfully launch a merchant-focused e-commerce marketplace, at a time when no one believed people would ever buy or sell over the internet. Today, our global ecosystem has grown to encompass over 70 businesses across e-commerce, digital content, communications and fintech. Through these, we empower the communities in which we operate and our thousands of merchants and partners, and bring the joy of discovery to almost 1.3 billion people worldwide. Globally, we challenge the status quo by investing in new business models and start-up talent, from new open platforms for e-commerce, to experiments with drones, chatbots, deep learning and AI. We also lead Japan on improving data management and privacy standards. Our global footprint continues to grow, and I am truly inspired by the talent that chooses to work with us every day, both within the Rakuten family and in start-ups, academic institutions and partner businesses around the world. This year we’re proud to start our partnership with FC Barcelona. Just as Barcelona is "Més que un club," Rakuten is more than a company. We are a community. A community united by a belief that technology can empower people to realize their ambitions. Together, we believe in the future. Rakuten Crimson House is an open and functional workplace where people and ideas thrive. We believe that creative innovation is born from open communication.